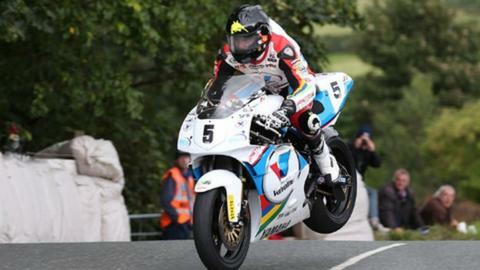 Bruce Anstey set the fastest time of the week so far in practice for the Classic TT Formula 1 race on the Isle of Man on Wednesday evening. New Zealander Anstey posted a lap speed of 122.523mph on the two-stroke Yamaha YZR500, owned by Padgett's Racing, on his second lap of the session. Ballymoney's Michael Dunlop, 25, lapped at 122.173mph on his Suzuki GXSR XR69. Ryan Farquhar was fastest in the 500cc class on a Paton, with William Dunlop topping the 350cc category on a Honda. Team Winfield rider Farquhar recorded a stunning opening lap of 111.102 on Wednesday, marginally outside Olie Linsdell's fastest lap of 111.66 from last year's race. William's speed of 101.271 meant he was the only rider to top the 100mph benchmark among the 350s, on board his Davies Motorsport four cylinder Honda. Experienced classic racer Roy Richardson led the Formula 2 times on 110.35, followed by James Cowton, 109.89. Anstey, winner of 29 international road races, admitted to having "a massive smile" after his fast lap on the exotic Yamaha motorcycle. "The bike's handling is pretty good, although once the fuel lightens on the second lap, it gets a bit lively," said the 45-year-old. "We're just slowly getting it down, playing it safe. The bike was definitely on song and there's more to come." England's James Hillier was third quickest on a Kawasaki with 119.396, Russ Mountford was fourth fastest on 119.127 and Steve Mercer fifth on 118.298.